The Snack & Save Canada coupon portal has a new coupon available, perfect for movie awards night snacking. 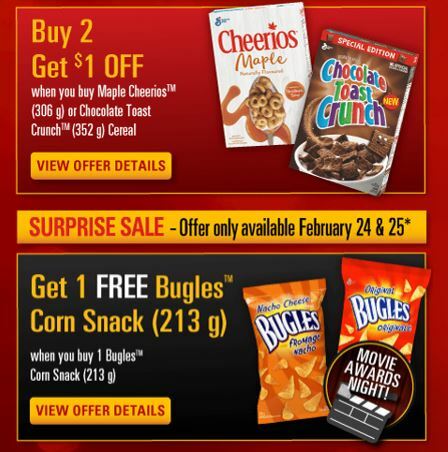 If you’re going to be watching the Oscars you will probably need some snacks as it’s a lengthy show, so head over to the Snack & Save Canada coupon portal by clicking the link below, where you can print your buy one get one free Bugles coupon. The coupon is valid today and tomorrow only, February 24th & 25th, at select Loblaws banner stores. You coupon can be printed and redeemed at the following locations: Atlantic Superstore, Loblaws Provigo, Zehrs, Valu-Mart, Independent, and Fortinos. Click here to print your buy one get one free Bugles coupon from the Snack & Save Canada coupon portal.